#1 Organic Meal Kit Provider, Sun Basket, Raises $15 Million Series B to Create the First National Organic Home Delivery Service, Reaching More ZIP Codes Than the Largest Grocery Chain in the U.S.
SAN FRANCISCO, CA--(Marketwired - July 26, 2016) - Sun Basket (www.sunbasket.com), the leading organic meal kit provider delivering the best organic, non-GMO ingredients and delicious, easy-to-make recipes weekly to your door, today announced $15 million in Series B financing to create the first national organic home delivery service, which will serve 98% of the US population. Led by Accolade Partners, a leading venture capital and growth equity investment management firm, the round also includes investment from new top-tier investors, Founders Circle and Shea Ventures. Existing investors, including Paul Allen's Vulcan Capital, PivotNorth Capital, Relevance Capital, Filter14, Baseline Ventures and other high profile investors, also joined the round. On track to grow revenues by 10X this year while maintaining strong margins, Sun Basket has raised over $28 million to date. The company will use the new funding to open a third distribution center, build a state-of-the-art procurement platform, and fuel its rapid growth. Over 60% of Americans report that they would prefer to buy organic*; however, organic products currently comprise only 7% of U.S. grocery sales due to inaccessibility, lack of consistent quality, and higher cost than conventional food. With its direct-to-consumer model, Sun Basket solves the access and quality issues by building a fundamentally more efficient supply chain, which already can deliver organic food to the majority of U.S. households up to three times faster than a traditional grocery store (three to five days vs. two weeks). By providing pre-measured ingredients, Sun Basket's home cooked organic meals reduce food waste and cost as much as 40% less than the same meal comprised of conventional, non-portioned ingredients purchased at a grocery store. "Building on its steep revenue growth trajectory and clear market leadership position, Sun Basket is developing an unrivaled national procurement and organic food delivery platform," said Atul Rustgi at Accolade Partners. "With its third distribution center, which will open later this year, Sun Basket will reach more ZIP codes than the largest grocery store chain in the US, ideally positioning itself to capitalize on the unmet demand for organic and non-GMO foods, the fastest growing supermarket segments." "Sun Basket's mission is to become America's favorite way to cook healthy meals, which is a multi-billion dollar opportunity," said Adam Zbar, Sun Basket CEO and Founder. "By disrupting the $600 billion grocery market with a more efficient, direct-to-consumer model, we're providing customers with the freshest organic ingredients, which when combined with quick, delicious recipes from our Chef Justine Kelly, creates a more convenient and healthy way for busy working people to cook at home." Sun Basket has assembled a top executive team to help achieve its goals, including COO Don Barnett, who co-founded organicgirl, the second largest provider of retail packaged organic produce in the United States. As part of the Series B round, 25-year Silicon Valley veteran Drew Hamer has joined the company as CFO. With his extensive experience working with private and public companies, Hamer helped take Excite@Home public and was the CFO for Keynote Systems, a publicly traded company. Sun Basket's culinary team is led by Executive Chef Justine Kelly, who served as the head chef at the James Beard Award-winning restaurant, The Slanted Door. Chef Justine has focused on combining the best seasonal produce with globally inspired flavors to create nourishing meals that are balanced, healthy and delicious. Her recipes, which include options for Gluten-free, Paleo, Vegetarian and Omnivore diets, are for people who want to eat clean and feel great. Each recipe is vetted by an in-house nutritionist for low sodium content, low processed sugars, healthy fats, and nutritionally dense ingredients. To ensure Sun Basket's offering is as sustainable as it is healthy, the company announced today its roll out of the industry's first 100% recyclable and compostable packaging, which promises to dramatically reduce the waste associated with shipping its boxes to customers nationwide. The new packaging is expected to divert over five million pounds of waste from municipal landfills within the first twelve months and will include the first truly recyclable insulation liner; the only gel packs with all-natural, fully compostable fill; and compostable ingredient bags. 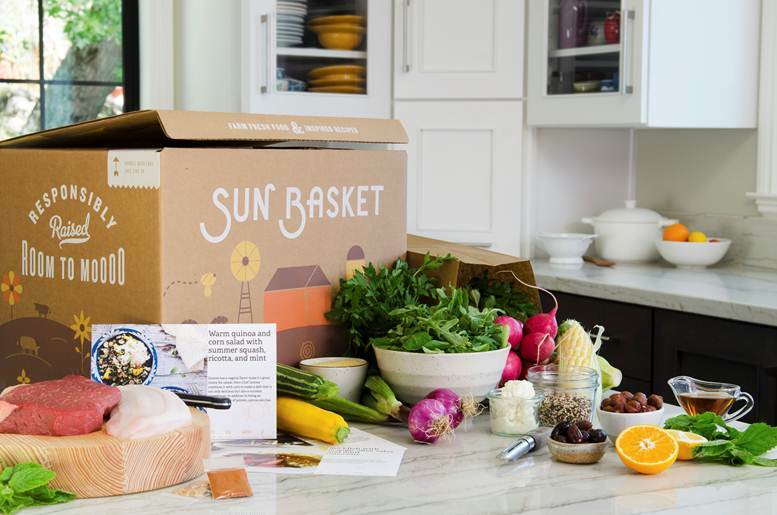 Founded in San Francisco in 2014 by Webby-winner Adam Zbar and San Francisco's James Beard Award-winning Chef Justine Kelly, Sun Basket is the leading organic meal kit provider delivering the best organic, non-GMO ingredients and delicious, easy-to-make recipes weekly to your door. Sun Basket saves busy people the time of planning and shopping so they can focus on the fun part of cooking and enjoying the meal. Personalized for your lifestyle and diet, Sun Basket provides a seasonally inspired Chef's Basket, along with Gluten-Free, Paleo and Vegetarian meal options. Located in San Francisco, Sun Basket is backed by top-tier venture capitalists including the investor behind Instagram. Celebrity Chef Tyler Florence acts as Culinary Co-Founder, and is joined by COO/Board Member, Don Barnett, Co-Founder of organicgirl produce. For more information, please visit https://sunbasket.com or on Facebook, Instagram, Pinterest or Twitter.